"Product designer" add-on doesn't have the predefined collection of fonts, colors and cliparts. Thus, first of all it is necessary to add these elements that will be used further for the design creation. To add fonts, colors and cliparts log into the administration panel and go to Content -> Product designer. In order to create a product, first create a category for it. Login to your CS-Cart admin panel and go to Products -> Categories -> click "Add category" button. On the appeared page choose the category name, its location and an image for it, if necessary. You can also add a description for the category, choose a page title, META description and keywords, etc. Once a category for your customizable products is created, you can create a product. Status - Choose a status: Active - everybody can see your product; Hidden - you can preview the product in the customer area but customers will not see the product page; Disabled - nither you nor your customers can see the product in the customer area. 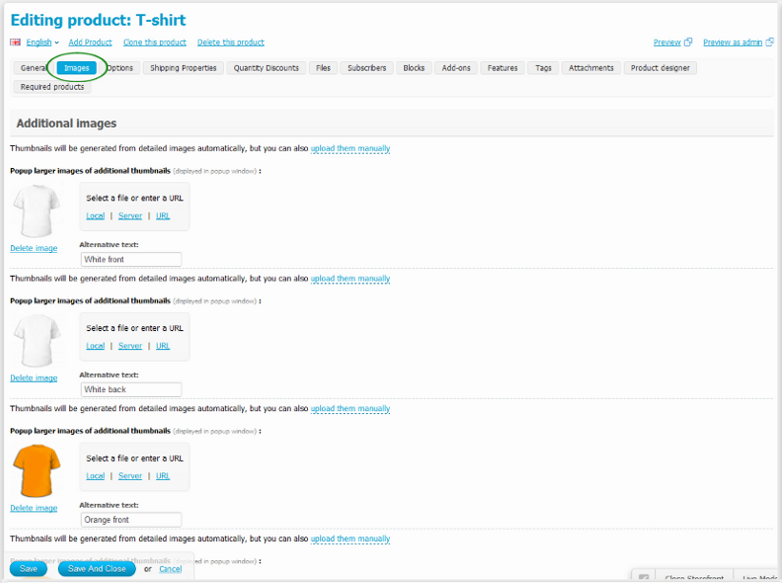 Images - Upload a main image for your product. You have to upload additional images to your product - images where your customers will add their design. To upload additional images to your product, go to your product editing page (Products -> Products -> Click "Edit" link next to your product). 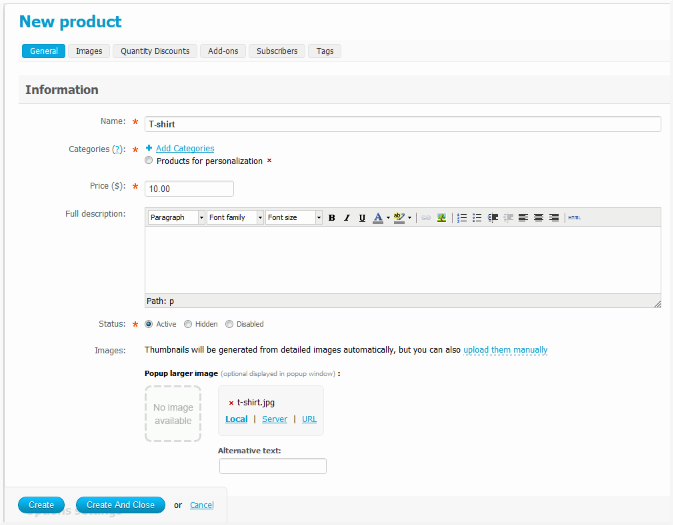 On the product editing page click "Images" tab and upload additional images. For example, if you have created a product T-shirt, you can upload the following images - t-shirt front, t-shirt back, t-shirt sleeve. If you sell t-shirts of different colors, you can upload images for each color. Don't forget to press Save button. On the product edditing page go to the "Product designer" tab and click "Enable for this product" checkbox. That's all, you can use Product designer tool. Your following step is to specify Product designer settings for your product, add a product side and canvas.